Masonic Lodge. The lodge remains upstairs and Chesterville Grocery is on the main floor. There have been four Masonic Buildings located on the lot; three were destroyed by fire in 1899, 1912 and 1939. Chesterville Union School was located at 3675 State Route 314. Built in 1890. Demolished in 1920. 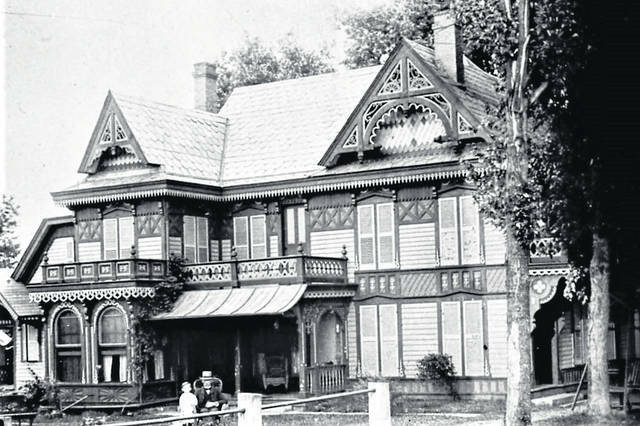 Dr. James Williams built a beautiful Victorian home next to the Masonic Lodge in December 1888. A small building sat between the house and the first Masonic building. There have been three in the same location and there were three different fires. He practiced medicine in this small building from 1885 until it burned down in the Masonic fire of 1899. The house itself was damaged in the second Masonic fire of 1912 and was repaired. When the Masonic Lodge burned for the third time on October 15, 1939 the house was a total loss. Ward Peoples’ Sawmill was located behind the Methodist Church. It served as a principal supplier to HPM Corporation in Mount Gilead. The mill closed in 1958. 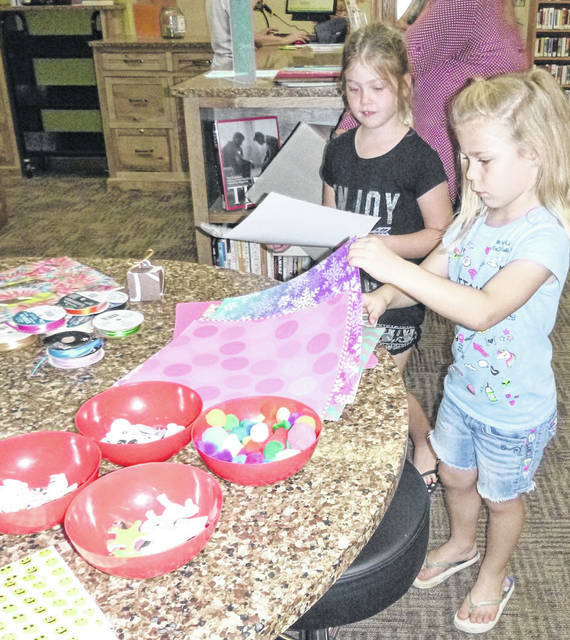 Kynnlie and Kendall Horton take part in a craft Saturday at Selover Public Library during Heritage Day in Chesterville. A registry from the Leonard House, a hotel built in Chesterville in 1830. Built by Enos Miles, it was destroyed by fire in 1887. 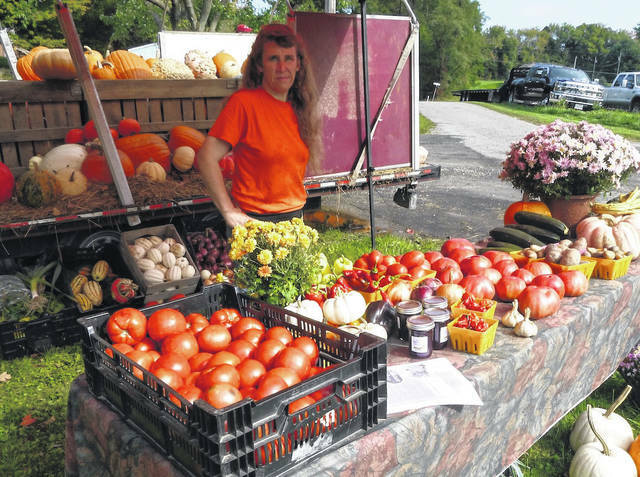 Bonnie Snyder of Danville sells tomatoes, celery, gourds and pumpkins during Heritage Day. 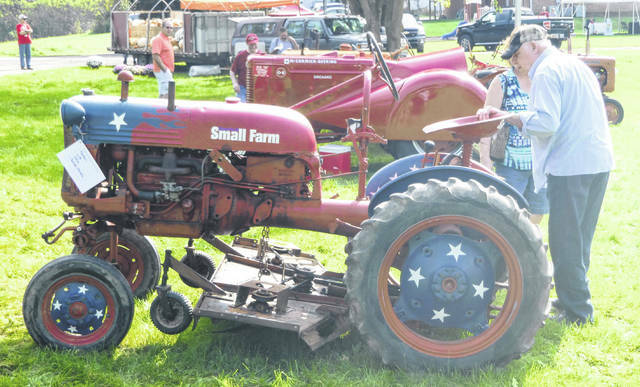 Visitors to Heritage Day check out antique tractors that were on display. CHESTERVILLE — Folks in this village take their history seriously. Chester Township was formed in 1808 while still part of Knox County. It grew rapidly, according to accounts compiled in “The Threads of Time: A History of Morrow County.” On April 25, 1812, the first election was held there. Last Saturday residents and visitors gathered to celebrate with the Chesterville Heritage Day festival. Among the attractions were historical displays, a parade, plenty of food, crafts and Doc Chester’s Medicine Show. “We come up every year to support small-town events. It’s important,” said Doris Orsborn, who brought her two-year-old daughter Makenzie. 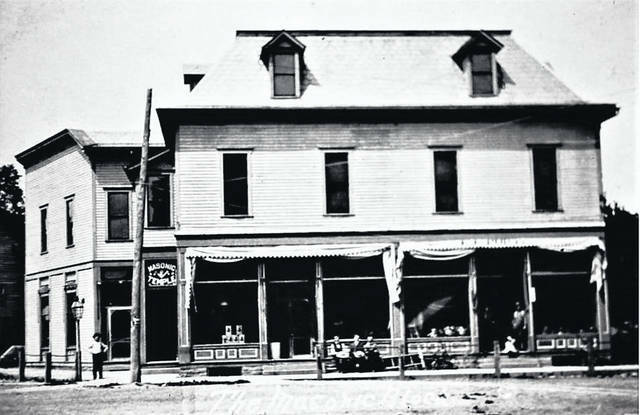 In 1867 the first town hall was constructed with assistance from the Independent Order of Odd Fellows Lodge No. 204. David Miller, Edward Evans (aka The Welshman) and James McCracken were notable early residents of the settlement. William Dodd was the first justice of the peace and Rufus Dodd the first assessor of taxable property. Dodd was paid $3 by the county for this service. Residents like Candace Thompson come back to celebrate the bygone days. “I grew up going to all of the Heritage Day Festivals and love seeing the community join together again. Very well organized and a lot of thought went into the planning,” Thompson said. Early settlers brought with them a deep reverence for the church. The first denomination represented was the Old-School Baptists. Formed around 1816, Henry George was its preacher and he had a small farm adjacent to the 20-member church. That love of church remains evident. The Chesterville United Methodist Church hosted a spaghetti supper Saturday afternoon during the festival. Like many frontier towns, Chesterville had a post office established in 1837. Mail was carried on horseback from Marion to Mount Vernon twice weekly, with the carrier staying overnight in Chesterville. There was no shortage of unique buildings, from Dr. James Williams’ beautiful Victorian home next to the Masonic Lodge to Enos Miles House and the Old Union School. In 1830 the township boasted a population of 778; by 1850 it had swelled to 1,620 residents. 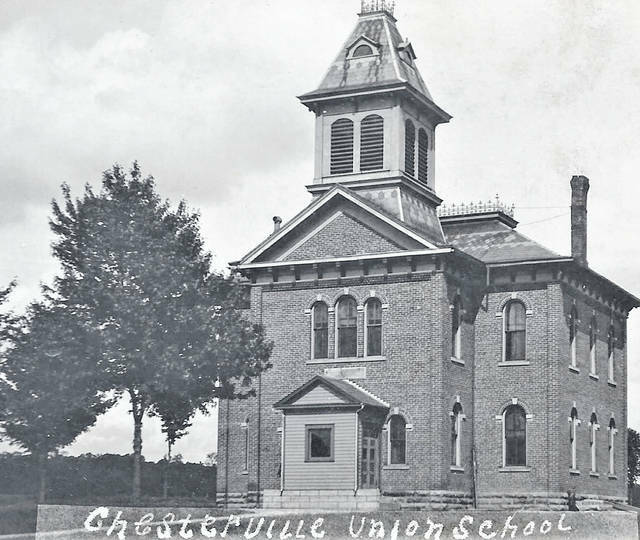 In 1852 Chesterville organized its first school district. Students today attend Highland Local Schools, which was formed from the Chesterville, Sparta and Marengo communities in 1961. Those were well represented at Heritage Day by Katy and John Farson. “I grew up here and he’s from Sparta. He went to Highland East and I went to Highland North,” Katy said as the couple brought Kempton, 3 and 1/2, and Landyn, 1, to the festival. “My grandparents owned a farm just outside of town, and we moved back here from Westerville to be near family. This is home,” she said. 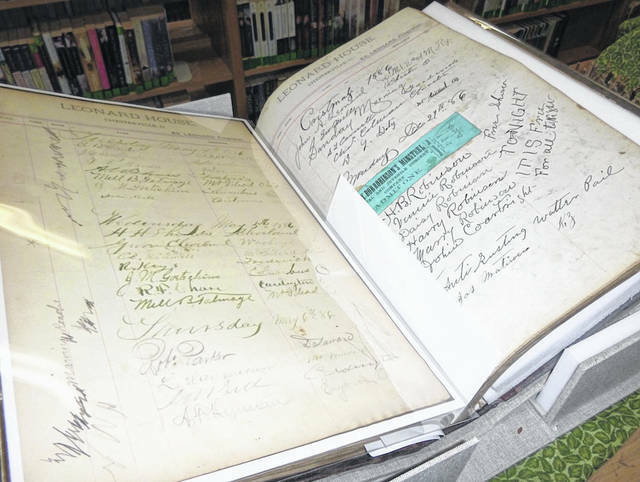 Daniel Selover donated $10,000 in memory of his parents so a library could be built in 1924. It was dedicated two years later and continues to serve as a meeting hub of Chesterville. It was a busy place Saturday as visitors enjoyed free popcorn, balloons and crafts for youngsters. A book sale was also held. Earl “Greasy” Denman operated a Chevrolet dealership and garage from the 1930s to the 1980s where the firehouse now sits just south of the Ohio 95/314 intersection. Rocki Huddleston and other firefighters with Big Walnut Joint Fire District took part in Heritage Day. They gave out free smoke alarms and took part in the parade. “We have the smoke house by the church. Our goal is public education,” she said. Dave Rupp brought his wife’s canned goods from Fredericktown to sell. Sue’s Herbs & Jellies was among the vendors who brought home-baked and home-grown items. Pies, cookies, pumpkins and crafts were in large supply. “She’s at another festival. She comes later and we eat dinner and make a day of it. We had good luck here last year,” Rupp said.